Latin America’s powerhouse LATAM Airlines Group believes it has turned a corner in its Brazilian operations after enduring weak margin conditions within Brazil’s domestic environment since the merger of LAN and TAM officially closed a little over a year ago. The company’s overall 3Q2013 results were somewhat buoyed by a 19% improvement in Brazilian domestic unit revenues year-on-year as LATAM slashed its supply within Brazil by 6% during the quarter. For the 9M2013 time period LATAM’s ASKs within Brazil contracted by 9%. While the rebound within Brazil in commendable LATAM still faces challenges with respect to the devaluing of the BRL, which fell 13% during 3Q2013 against the USD. LATAM is attempting to blunt the effects of currency fluctuations through hedging schemes and transitioning TAM’s debt to the LATAM balance sheet, which is denominated in the USD. In addition to a significant rise in unit revenues within Brazil, LATAM’s load factor in the domestic market increased 4ppt to 82% year-on-year during 3Q2013, and has risen 14ppt compared with 3Q2011. LATAM’s loads increased year-on-year despite a 1.7% decrease in traffic in its Brazilian operations, which could indicate some trade-off in loads for yields. Along with capacity cuts, LATAM also believes its strategy of focussing on market segmentation that entails TAM maintaining its strong presence among corporate customers allows it to better capture higher-yielding revenue than its Brazilian competitors, including Brazil’s second largest carrier Gol. LATAM’s revenue strategy in Brazil also encompasses a price-stimulating element that allows the carrier to steadily improve its load factors. LATAM also maintains that it has kept a commanding 40% market share within Brazil, whereas Gol has ceded market share as it works to improve its fortunes, which unlike LATAM are largely tied to the Brazilian domestic market. During 1Q2013 Gol recorded a 6ppt decline in its market share year-on-year to 35%. Pressed about signs of perhaps an uptick in overall industry capacity within Brazil during 2014, LATAM executives assured analysts that its ASK offer in the Brazilian domestic market would be flat during that year, which means the company will stay the course in attempting to rationalise supply with demand and pricing trends. Even as LATAM is celebrating a turnaround within its Brazilian operations, currency pressure did help drive down the company’s overall passenger yields by 1% during 3Q2013. The company is assuring that it is softening the effects of currency fluctuations by moving TAM’s debt and aircraft obligations to the LATAM balance sheet. The majority of the aircraft delivered after the close of the merger in Jun-2012 have been financed by the parent company LATAM Airlines Group regardless of which carrier will ultimately operate the jets. As of 30-Sep-2013 LATAM had reduced its BRL exposure shown on its balance sheet from USD4 billion to USD2 billion, and has a stated goal of a further reduction to USD1.6 billion before eliminating its BRL risk entirely by Jun-2014. Additionally, LATAM has also hedged part of its exposure to the BRL during 2014 at about 50% of its exposure or USD500 million at a rate of BRL2.30 to USD1.00. During 3Q2013 the exchange rate was BRL2.29. During 3Q2013 international long-haul operations accounted for 33% of LATAM’s total capacity, and load factors on those routes remained flat year-on-year at roughly 84% as capacity increased 2%. The company stated those results are encouraging signs of improvement as LATAM has faced pressure in those markets from foreign carriers adding more capacity into South America (some of which is from its oneworld partner American). LATAM believes its efforts to consolidate long-haul service from Brazil at Sao Paulo Guarulhos instead of having services splintered at that airport and Rio de Janeiro have also contributed to a recovery in the performance of its long-haul operations. Related to the airport consolidation LATAM has grounded 10 of TAM’s older Airbus A330s and replaced the widebody jets with Boeing 767s that feature lie-flat seats in business class. The cycling out of the older Airbus jets is also a cost cutting measure as the newer 767s have a lower unit operating costs. While it is still early days of a TAM-American Airlines codeshare that launched in Aug-2013, LATAM is encouraged by early results. TAM is building up market share in the offline markets covered under the arrangement, which is also helping LATAM to improve its fortunes in long-haul markets because it can leverage American’s extensive US domestic network through the new codeshare. 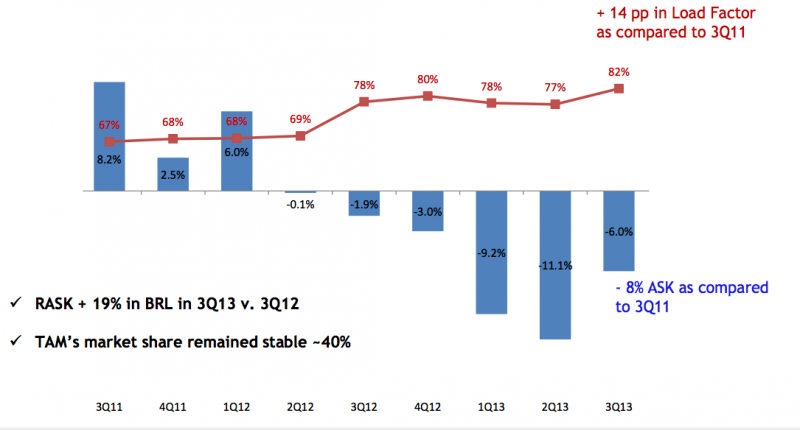 Overall LATAM turned a solid performance during 3Q2013 as the company reversed a USD49 million loss the year prior to a USD52 million profit. Operating income jumped 142% to USD255 million and its operating margin improved 4ppt to 7.6%. Top-line passenger revenues increased 0.8% to USD2.8 billion while growing 0.4% on a unit basis. Overall expenses decreased by 4% to USD3.1 billion as unit costs excluding fuel fell 1.4%. A decrease in employee headcount resulted in a nearly 4% drop in wages year-on-year during 3Q2013. Nearly every cost line item fell with the exception of maintenance expense, which grew nearly 22% driven by preparing aircraft coming off lease for redelivery and a net increase of 19 aircraft between Oct-2012 and Sep-2013. LATAM’s guidance for FY2013 remains essentially unchanged from previous estimates of overall capacity growth of flat to 2% system-wide, with a 7% to 9% decrease in the Brazilian domestic market. Capacity in the carrier’s Spanish speaking markets within South America that encompass Argentina, Chile, Colombia, Peru and Ecuador should rise between 12% and 14%. Notably, LATAM management has not remarked in great detail about the carrier’s performance in those markets. During 3Q2013 traffic in the South American Spanish speaking countries increased 10% on a nearly 13% increase in capacity, which drove load factor down 1.7ppt to 78%. Despite the lack of commentary, LATAM is still expanding in most of those areas – LAN Ecuador is now the second largest domestic carrier in the country, and LAN Colombia is also the second largest carrier in the country’s domestic market. One of the sacrifices LAN made in forging its landmark merger with TAM was losing its investment grade status as the combined company for the 12 months ending in Jun-2013 had an adjusted net debt ration to EBITAR of 6.5. As of 30-Sep-2013 the ratio had fallen to 5.8. Previously, LATAM has stated it should return to ratios of 3.5 in about four years, which is close to the time period when the company should realise its often-stated merger synergies of USD600 million to USD700 million. In the short term LATAM has issued a USD450 million securitized bond in Nov-2013 with a 6% interest rate pegged to pay off short-term debt and also plans to issue 62 million shares of common stock to also pare-down debt and improve its liquidity position, which at the end of 3Q2013 was roughly USD1.8 billion in cash. LATAM appears to be making all the proper moves to right the course in Brazil’s sluggish domestic market and shore up the combined balance sheet, which suffered with the incorporation of TAM. It seems LATAM’s executives believe losing its investment grade rating – a rare feat in the airline industry – for a few years is worth the expected benefits of the merger. For the moment it seems LATAM is on the upswing; but only time will tell if the momentum lasts.